I keep a one-gallon bag of homemade breadcrumbs tucked in the freezer. The bag grows fatter week by week with odd ends of olive loaves, stale bagels, nubs of potato bread and too-old slices of homemade rye. The bread scraps will get slicked with olive oil and toasted into croutons; those that remain will be pulsed in a blender and zipped into the freezer bag. There they remain, until meatballs need making or a pile of spaghetti with herbs and cream begs for an extra hit of texture. Currently, I have a favorite way to use those breadcrumbs waiting in my freezer. Determined to celebrate asparagus season as long as possible, I blanketed a platter of fat, roasted spears with toasted breadcrumbs and a few poached eggs. The runny orange yolks — courtesy of hens Alice, Riggs, Garfield, Houdini and George Costanza (yup, I know they're female) — mingle with the tender-sweet stalks and golden breadcrumbs for a dish that meets all go-to notes of color, flavor and texture. Here’s the recipe. Toss the breadcrumbs with a few glugs of olive oil and a generous pinch of salt. Toast in the oven until golden brown and fragrant, about 5 minutes. Raise the oven temp to 400 degrees. Rinse the asparagus under cold water. Shake to remove excess water, but don’t dry. I like keep them slightly damp so they steam-roast without drying out or turning into slack, drooping spears that are kind of a drag to eat. Pile asparagus on a sheet tray. Roast in the oven 6-8 minutes, until the stalks feel slightly tender but still sturdy. Let rest for five minutes. Meanwhile, set a small saucepan of water to boil and add a good pinch of salt. Crack two of the four eggs into a small bowl or mug. When the water is boiling, turn the heat down to a rapid simmer and run a wooden spoon around the inside of the pot to create a whirlpool. Delicately drop the cracked eggs into the center of the whirlpool. Allow to cook until the whites are coagulated but the yolks are still runny. Remove poached eggs with a slotted spoon and set on a paper-towel-lined plate. Repeat with the two remaining eggs. 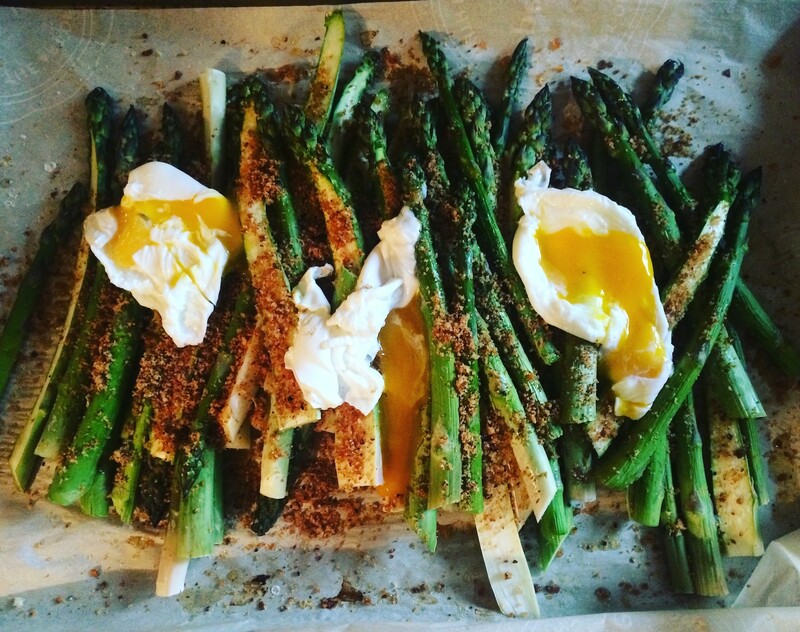 Scatter toasted breadcrumbs over the asparagus and top with the poached eggs. Split the eggs with a fork or knife, so the yolks run into the bright green spears and crunchy breadcrumbs. Serve immediately.